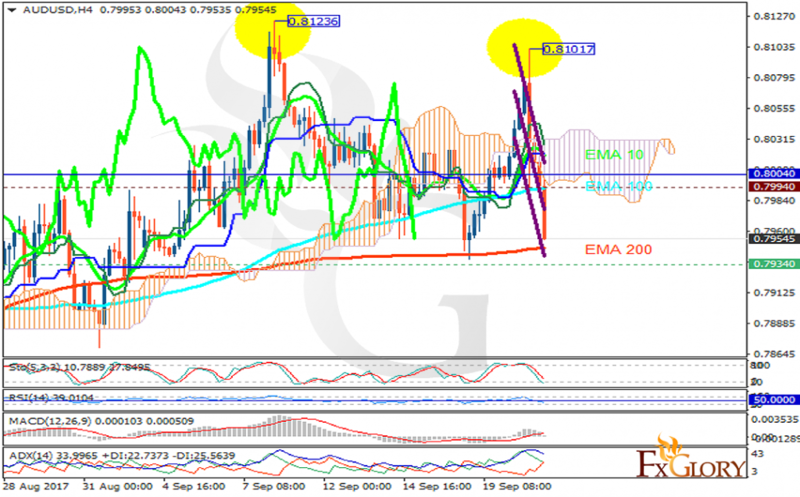 AUD has been supported by the Reserve Bank of Australia (RBA) Assistant’s speech. The support rests at 0.79340 with resistance at 0.79940 which both lines are below the weekly pivot point at 0.80040. The EMA of 10 is moving with bearish bias within the descendant channel but it is above the EMA of 200 and the EMA of 100. The RSI is falling towards the oversold area, the MACD indicator is in neutral territory and the Stochastic is showing downward momentum. The ADX is not showing any clear signals. The price is below the Ichimoku Cloud and the Chinkou Span. The Tenkan-sen is showing a downward trend while the Kijun-sen is showing a horizontal trend. The support level seems to be too strong to be broken therefore AUDUSD will start its correction pattern after the sudden decline to grow towards 0.8 area.